It's a debate that will likely rage on forever - what's the scariest movie of all time? Fear is all relative. Something that's scary to you may be harmless to your friend, and vice versa. But there are movies that scare almost everyone. For me, 1973's "The Exorcist" is creepy every time I watch it. Even though I know what's happening, and I've seen the film several times, there are certain scenes that I'd prefer not to watch. "The Shining" is also a horror movie gem. Obviously one of the best ever, but many don't find the film as scary as they do beautiful or peculiar. IMDB: The Exorcist (1973): When a teenage girl is possessed by a mysterious entity, her mother seeks the help of two priests to save her daughter. Esquire: The Texas Chainsaw Massacre (1974): At the height of the Vietnam War, a group of young hippies travels through Texas and discovers that America is crawling with its own backwoods terror. The movie was originally billed as a true story in a genius bit of marketing and political commentary, and broke all the rules of what was acceptable in a mainstream movie. The Hollywood Reporter: Funny Games (1997): It's rarely classified as a horror movie, but this Austrian home invasion flick remains one of the most terrifying, if not traumatizing, films ever made. Ostensibly the story of two young psychopaths who terrorize a family on vacation, Funny Games is really about how bringing fear to the viewer is a question of pure cinematic manipulation, with director Michael Haneke thwarting expectations at each turn and forcing us to suffer the consequences. Next time a neighbor asks to borrow an egg, lock your door. Complex: The Texas Chainsaw Massacre (1974): The Texas Chainsaw Massacre is a slasher picture, too, but it stands out from Halloween because, more than anything else, it's an ordeal. Watching Tobe Hooper's 1974 film, even today, is too mu ch like watching a snuff film. IGN: The Shining (1980): Stanley Kubrick's movie adaptation of The Shining is almost certainly the most popular Stephen King film. The project was an unusually commercially-focused one for Kubrick, but the same stylistic elements that defined his earlier films were on full display, and the film remains a haunting and unsettling chronicle of a family man's psychological breakdown. 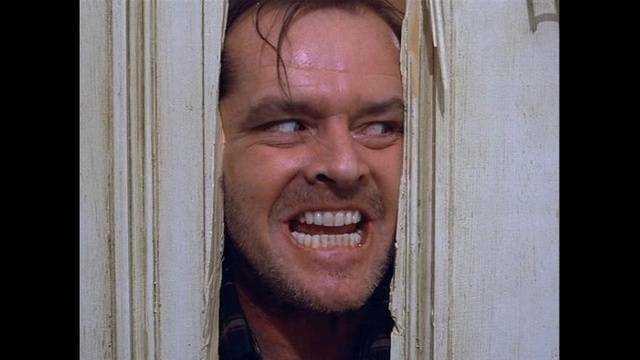 CinemaBlend: The Shining (1980): Upping the supernatural ante of Kingâs alcoholism-fueled descent into madness, Kubrick meticulously took each maddening piece of this claustrophobic story, which sees a writer and his family caretaking a very special hotel, and jammed it into another until it resembled the iconic Overlook carpet. Elle: The Shining (1980): Stanley Kubrick, Stephen King, and Jack Nicholson p roved to be a horror dream team in this 1980 fright fest. There are too many horrifying scenes in this nearly 2.5-hour film to start listing them here. With that said, itâs probably a safe bet to just never stay in any hotel room numbered 237.